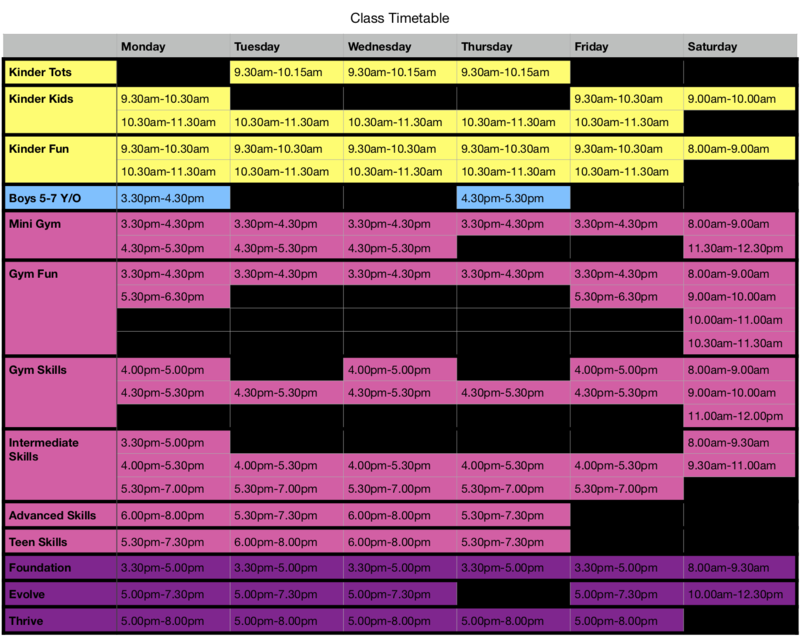 New enrolments can be taken at any time throughout the year. Your preference of day/time from the table below (please include more than 1 option if possible as classes may be full). Please note we will email or call to confirm a trial, Please DO NOT turn up without confirmation from us as classes may be full and your child may not be able to participate. Class fees will be invoiced via email with fees due prior to commencing classes. Fees can be paid by EFPOTS, or cash, cheque or direct deposit. Once you have become a WDYC Gymnast – your term bookings will automatically roll over and a new invoice will be emailed to you for the new term. Class fees will be invoiced via email with fees due prior to commencing classes. Fees can be paid by EFPOTS, or cash, cheque or direct deposit.
! We do require notification if your child is not returning. If notification to the office is not confirmed in writing, a fee will apply. If your child is currently in a competitive program at another gymnastics club, please contact the office to arrange a placement trial. The cost of the trial class will be added to your term invoice. Should you wish not to proceed with placement, the cost of the trial will not be charged. Once you have undertaken your trial and if successful in being selected to join our Competitive Program – our Adminstration team will request an athlete transfer from your existing Club across to our Club. Please be aware that your previous Club has to release you for the transfer to progress. Please refer to our Policies and Fees for our fee policies and procedures.